The successive waves of German-speaking immigrants who relocated to America throughout the eighteenth and early nineteenth centuries have left an enduring and far-reaching influence on cultural and artistic landscape of this country. While forty-eight of fifty states experienced significant Germanic settlement, no other colony and region benefitted from and was transformed as significantly by their presence than was Pennsylvania. Among the first to arrive in support of William Penn’s “Holy Experiment” in establishing the colony in 1683, Germanic settlers continued a steady migration to Pennsylvania throughout the first half of the nineteenth century. Diverse in background, representing Swiss, Austrian, German Palatinate, Alsacian, Prussian, and numerous other Germanic traditions in Europe, these populations most often partially assimilated into the surrounding, dominant English colonial culture while maintaining important aspects of identity and tradition from their homelands. In this process, the rich, hybridized culture of the Pennsylvania Germans developed, invigorating and transforming the local intellectual, political, economic, and creative identity of the region. While the highly skilled full- and part-time craftsmen were represented within the Pennsylvania German immigrant community throughout its history, their greatest period of artistic achievement seems to have occurred from 1770 to 1840. Roughly coinciding with seven decades of marked agricultural and mercantile development in the southeastern counties surrounding the urban port of Philadelphia, numerous rural, village, and urban craftsmen interpreted the changing needs, aesthetic tastes, and traditional activities of a burgeoning, prosperous, preindustrial community. The craftsmen, many of whom also labored seasonally as farmers, supplied a wide range of high-quality utilitarian and decorative household goods to both Germanic and Anglo-American consumers. The subsequent migration of Pennsylvania German settlers west, north, and south further spread the influence of Germanic traditions into the decorative arts of those regions. Their work inspired close parallels in the production methods, ornament, and aesthetic preferences embraced by craftsmen working in eighteenth- and nineteenth-century Ohio, Kentucky, Tennessee, Maryland, Virginia, North Carolina, South Carolina, Canada, and elsewhere. Characterized by fine craftsmanship, a love of color and ornament, and the preferred use and maintenance of traditional forms and motifs, the furniture, pottery, metalwork, illuminated fraktur, and other craft products emanating from this rich community of craftsmen and patrons would rarely have been considered art by their makers or owners. These objects were instead valued because of the shared experiences and meaning their form or decoration might have conveyed, or because of the combination of utility, household decoration, communication of status, and daily convenience they may have afforded their owners. 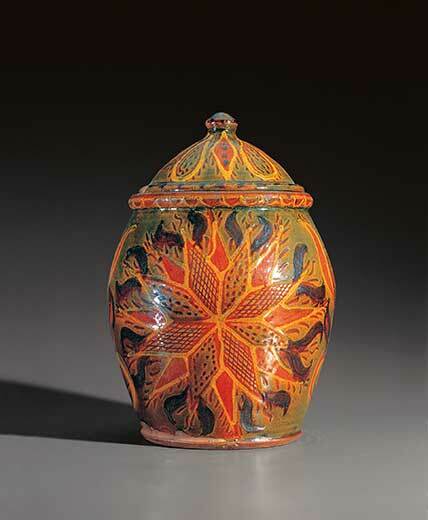 One of the strongest decorative arts traditions maintained within the immigrant Germanic populations that settled in Pennsylvania between 1683 and 1850 was that of ceramics. Both utilitarian and decorative household forms, made from rich local clay deposits, were produced by highly skilled potters working in Philadelphia and the surrounding agrarian communities of Chester, Bucks, Lancaster, Montgomery, and Berks Counties from the earliest period of their settlement. Domestic needs and the developing agricultural market economy of the region created a burgeoning demand for utilitarian earthenwares and stonewares, while the maintenance within these communities of earlier European traditions of decorative ceramics used in ceremonial presentation, gift giving, and foodways ensured the survival of a range of highly ornamented, colorful forms. Although a longstanding tradition of stoneware production existed in Germany, early examples of domestically produced white or gray stoneware are rare in Pennsylvania, and few traditional Pennsylvania German potters are known to have produced stoneware in the region prior to 1830. Only after 1840 were the finer, denser clays necessary to produce stoneware found in large amounts in the regions of York, Greensboro, Harrisburg, and Williamsport, in the south-central area of Pennsylvania. A number of small potteries and larger factories began to produce both plain utilitarian and decorated stoneware forms in these regions after this date, but their output and variety never equaled those of the earlier earthenware pottery traditions of the state. The potter most often combined his work with other seasonal activities, placing it into the agricultural calendar whenever the craft’s necessary labors could be best accommodated. Local potteries were often operated by a single master potter, who may have been assisted by an apprentice potter, journeyman, or trained family members, depending on the size of the business. Most smaller rural Pennsylvania potteries were able to supply only their immediate vicinity, and few of their products were retailed outside the local markets of nearby towns. Operations were usually passed down from father to son or through intermarriage, preserving not only their marketing position within the community but often the preferred forms, techniques, and decorations. Pennsylvania German potters employed a relatively limited range of traditional methods in producing their wares. The potter’s wheel was the most common forming method, although early immigrant Germanic potters adopted the use of molds through their interaction with the numerous local English-born or -trained potters. Simple thrown, slab-built, or molded wares could be augmented with surface decoration of appliqués, impressed designs, or, more commonly, the addition of incised sgraffito patterns or “trailed” slip decoration. Slip, or liquefied clay, usually yellow or white, could be mixed with metal oxides to produce greens, blacks, browns, and blues. This slip could be brushed or trailed over a form using a small pouring cup fitted with one or more quill spouts, which produced a fine line or lines of slip. The surface of the form could also be coated evenly with slip of one color and, once dried, scratched through to reveal the contrasting colored clay underneath. This sgraffito technique allowed for precisely drawn figural motifs, dates, or other inscriptions; colored metallic oxides applied as dry powders or slips provided further embellishment. The finished decoration usually received a final clear glaze coating composed most often of red lead, flint, and finely ground silica-rich sand. Source: Stacy C. Hollander, American Radiance: The Ralph Esmerian Gift to the American Folk Art Museum (New York: Harry N. Abrams in association with American Folk Art Museum, 2001), 430–31.